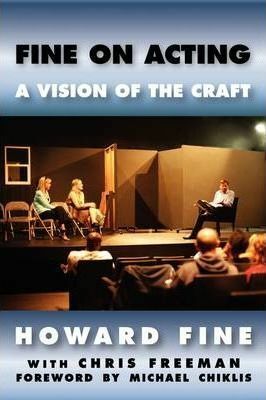 Heralded as "Best Acting Teacher in LA" by Back Stage magazine, Hollywood s most sought after acting teacher Howard Fine reveals the winning technique that has garnered his students international acclaim and the industry s highest honors in his astonishing book FINE ON ACTING. During his twenty-five years as a teacher and director, Fine has developed a technique that is both useful and exciting. Emmy Award(r)-winning actor Michael Chiklis (THE SHIELD, FANTASTIC FOUR) writes in the foreword for FINE ON ACTING, You ve purchased this book because you either aspire to be an actor or want to be a better one. Either way you ve made a wonderful decision. Howard Fine is a great teacher. His philosophy and approach to the craft of acting are the most helpful, encouraging and practically applicable I ve ever encountered. FINE ON ACTING covers the essentials for actors, including The Common Mistakes, Rehearsal, Auditions, Stage vs. Television and Film Acting, and Comedy vs. Drama. Fine also offers valuable advice for troubleshooting challenging situations, such as playing opposite a bad actor, nerves, memorizing lines, working with a bad director, and being emotionally blocked. A close colleague of the legendary Uta Hagen and the founder of the Howard Fine Acting Studio, Fine has worked with hundreds of stars, including Brad Pitt, Will Smith, Bradley Cooper, Chris Pine, Justin Timberlake, Lindsay Lohan, Salma Hayek, Simon Baker, Amanda Bynes, Gerard Butler, Jennifer Connelly, Dwayne The Rock Johnson, Michelle Williams, Val Kilmer, Sela Ward, Jason Priestley, Kerry Washington, Amy Smart, Jared Leto, Wilmer Valderrama, Brooke Shields, Daryl Hannah, Rick Fox, Estella Warren, Christopher Meloni, Enrique Murciano, Garry Shandling, Alexa Vega, Heather Locklear, Geri Halliwell, Carla Gugino, James Belushi, Diana Ross, Jon Bon Jovi, and Josh Groban. Fine is one of the few elite acting experts who has devoted his primary career to perfecting the teaching and coaching of professional actors. His outstanding reputation is the product of his remarkable expertise uniquely coupled with his extraordinary gift to inspire."